The TruckNet UK Drivers RoundTable • View topic - Ackworth / Onward Transport. to get on with the job. I am sure there are lots of former employees out their to prolong this thread. I will try and sort some photos out in the next few days. kevmac47. Re: Ackworth / Onward Transport. Didn't Onwards have a depot at Castleford? Think it closed soon after Swifts opened their Normanton depot in 1980 & taking all the Rockware glass work off them . particularly if you rely on satnav!!! I thought Bewick hauled out of there! They did "george" until our guy's took over the Mill and then we took over transport and cut vehicle movement on and off site by half as the local residents were "going mad" about a line of Onwards waiting to load and another line of hauliers "various" waiting to tip!!! Solution!!! Bewick Transport hauled everything in and out Bingo!! no more probs with the neighbours!!! Cheers dennis. as Bewick Transport was also perfect. Our customers called it "common sense" at the time Kev! Bewick. We did the same for J &J Makin and Devon Valley Industries ------They never had service like it and were prepared to pay good rates for it too !! Bewick. I assume all the guys who drove for Ackworth/Onward had plenty experience of driving Scammell Crusaders then??? was a pretty smart fleet if my memory serves me correct. Spookily enough I have an Aunt & Uncle who live in Ackworth!!!! although our shunt unit at Birtley was a very dilapidated Crusader. 9 months I was given a new E series ERF,I was like a dog with two tails!!! so I hope he will respond to this prompt???? If you've got any photos of that, it would be nice to see them. Sorry it took so long to find any pictures but here goes.The barrels outside the building are empties to go back to Stanlow, the sheeted load will probably be the aforementioned empties ready for shipping to Stanlow. The H &S brigade would have a fit if anyone tried to do this now as all the barrels are "on the roll" held in place by a back scotch with ropes attached. Kevmac47 PS the handsome brute is yours truly when I still had a little bit of hair left. Last edited by kevmac47 on Sun Sep 26, 2010 9:40 pm, edited 2 times in total. i can remember seeing a few of their motors ready to be sold off in bocs yard at barnsley in the mid 90s,i think boc had bought them out then disposed of the trucks. Not sure were this picture is from but its one of Akworths continental trucks. Onward took over part of Smith of Maddison and for a while their logo displayed "Onward for service". At one time Onward had the Thames Board contract with Robsons so they used to base a lot of lorries at Workington. georgeking wrote: Onward took over part of Smith of Maddison and for a while their logo displayed "Onward for service". Right "George" guess who had the contract at The East Lancashire Paper Mill Co Ltd. in 1990 and got kicked out? and guess who took the contract over and knocked it into shape? Photo's to follow!! Anon. rich12 wrote: i can remember seeing a few of their motors ready to be sold off in bocs yard at barnsley in the mid 90s,i think boc had bought them out then disposed of the trucks. 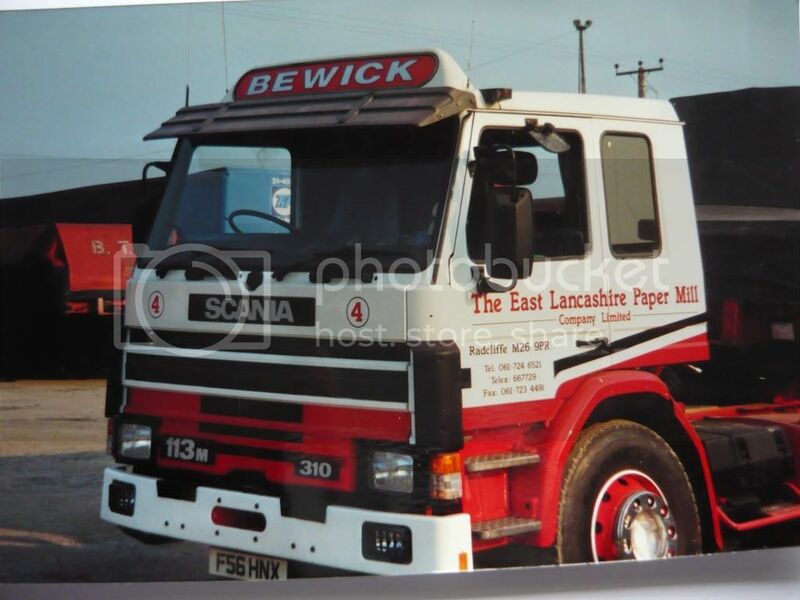 The ERF I bought showed BOC as the previous owner on the log book. I bought fleet no. 383 from a dealer in Coventry in 1996. Was'nt there another name in the group from way back same colours one word name, Yorkshire outfit plenty of motors can see them now the old grey matter won't let me remember the name used to dig in the Caledonian Rd with one of their drivers and had a few bevvies with the lad think he was called Ray but not sure but it was the early 60s. Great old firm with the traditional livery to match.... More pics please, remember them very well, especially the B-series ERFs with the livery like the one on the Ackwortth GUY. I always used to think to myself how lucky i was when i used to see one of Onwards with a double-stacked sheeted load. When did they finish the transport........? Catch me now ! if you can......... ! The other company which was an aquasition of the Ackworth/Onward group which ran in their colours but carried the name "Wheeler" pleased about that my brain was starting to hurt. steptoe wrote: Not sure were this picture is from but its one of Akworths continental trucks. Why didnt they re route the air intake and bung a bit of storage on that cab? Could this motor be the "Missing Link" ? Was it fitted with an 8LXB by any chance? The intrigue is that thick over the thread you could cut it with a knife!!!!! !Someone must know damn it!!!! I can here the chains rattling down in the SOM dungeon already, there'll be a riot shortly I just know it!!!! Bewick. Yes Dennis and if you look a little further back along this thread it mentions that Ackworth had a tie-in with SOM at one point,and that chicken nesting box nailed over the breather could be hiding those elusive two extra pots and if thats the case he'll always have a warm bum at bedtime. Onward had a depot in Stockport as well, Stakehill Industrial Estate If my memory serves me. Mainly Buffaloes and Crusaders based there. In the mid 70s they used to store raw materials for Kelloggs in Trafford Park, and when working for JB Carriers we used to load there regularly for the short trip, mainly palletised saxks of bran, sugar, gluten etc. Another job to there was to load 20t handball bran from either RHM or Spillers in Trafford Park on the old Atki, and unload at Onward passing the sacks down forthe lads to palletise for transit to Kelloggs. Kept us fit! Hiya "H" I think this Guy 4 wheeler would have had a Cummins 205/220 engine(or may-be a RR) I very much doubt that it had an 8 potter Gardner as I think the 8LXB had only come out in about '72 I think.I only suggested it might have had the 8 pot in to see if there was any abuse (or otherwise) from the SOM brigade but nothing doing there "H" Cheers Dennis. I recall when growing up my parents had high aspirations for me as they were always saying "you will HANG one day "
Is,nt it amazing! the few times ive posted about the Onward group some pontificating jodrell from the west has stuck his oar in to comment about how much better his company did the job. Who gives a flying ****? This site is about nostalgia and the rose coloured specs should be bringing us together not causing conflict. The aforementioned gent also talks about drivers being "promoted" as they (in his opinion) learn the correct way to do the job. use the ploy "if you wont do it I will have to take vehicle off you and give your trusty old A series ERF again".